Traprain treasure. From a photograph album of the Curle_family,1911-19. 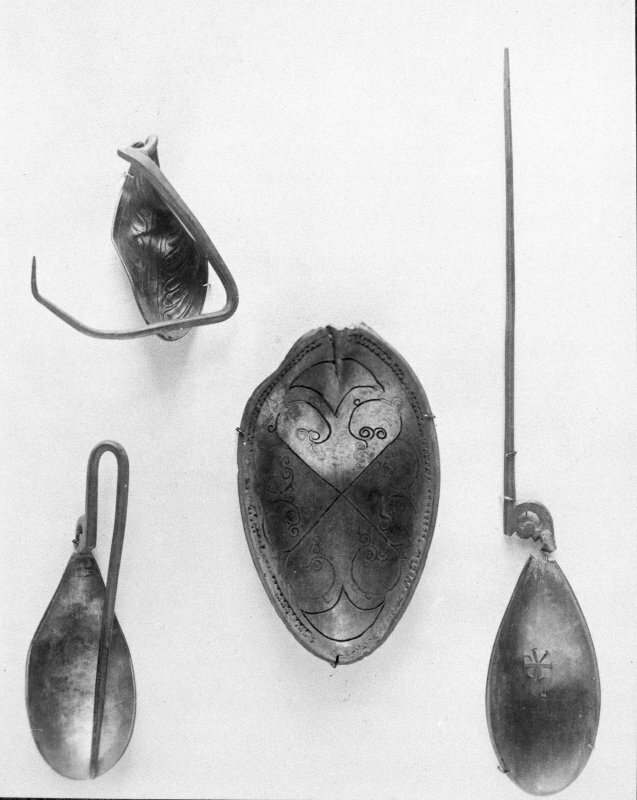 Traprain treasure - "Spoons". From a photograph album of the Curle family, 1911-19. 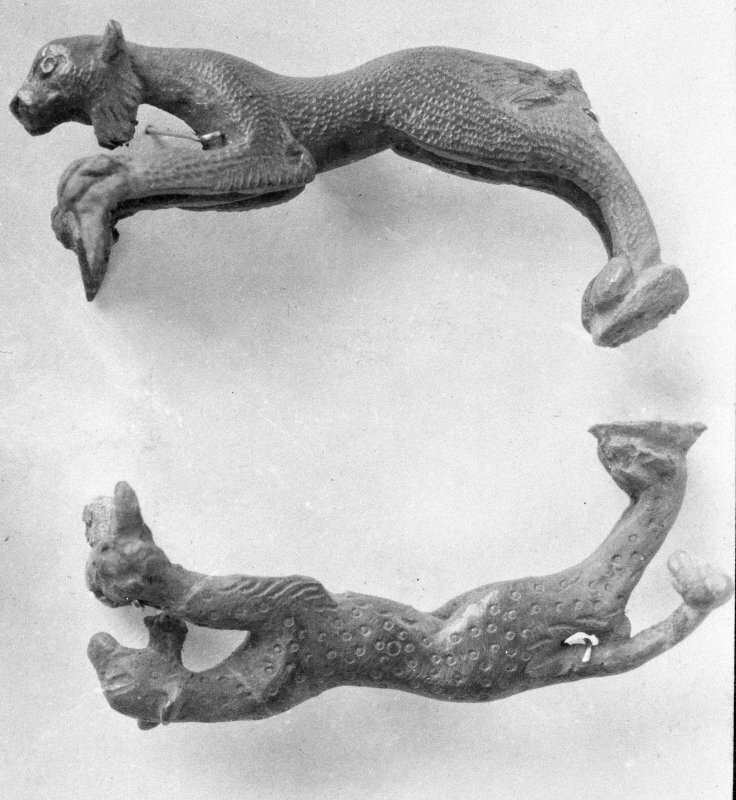 Traprain treasure - "a griffin handle". From a photograph album of the Curle family, 1911-19. Traprain treasure. From a photograph album of the Curle family,1911-19. 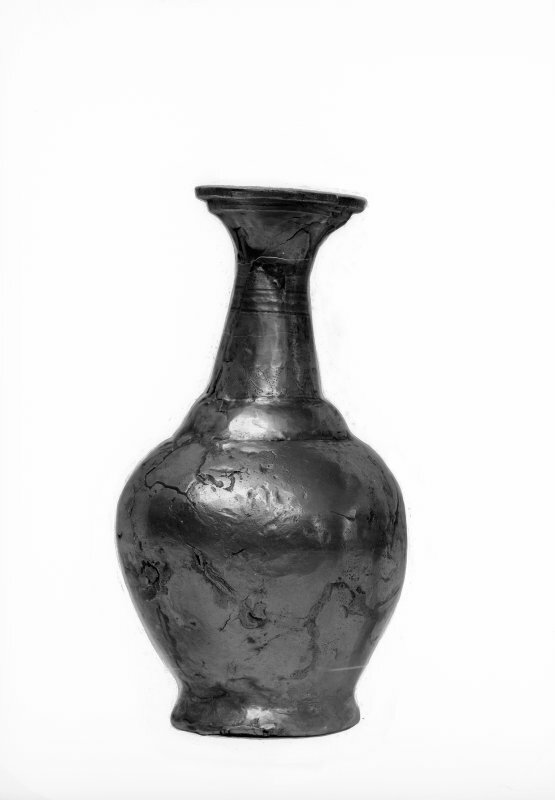 Traprain treasure - "Parcel gilt flagon".From a photograph album of the Curle family, 1911-19. 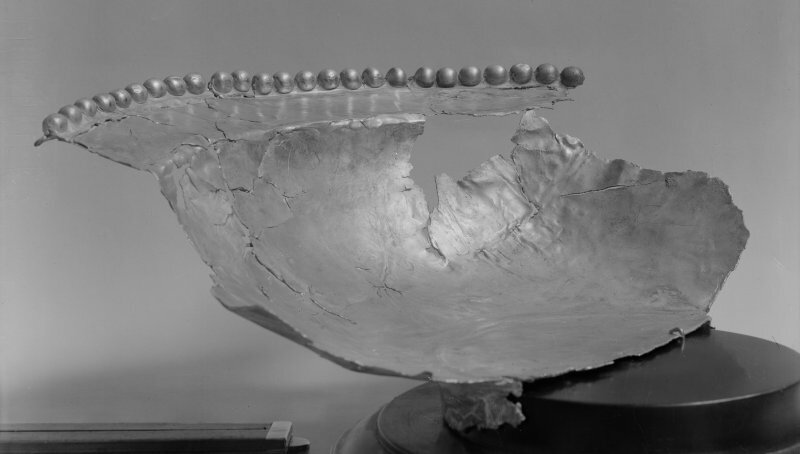 Traprain treasure - "a beaded bowl". From a photograph album of the Curle family, 1911-19. 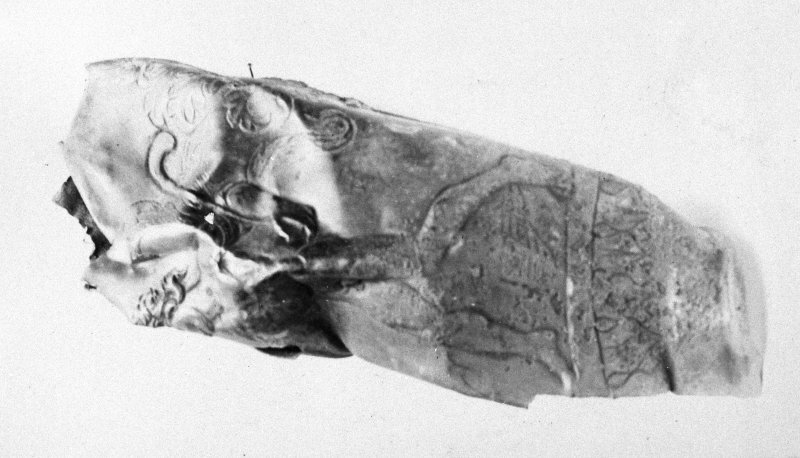 Traprain treasure - "a parcel gilt flagon". From a photograph album of the Curle family, 1911-19. 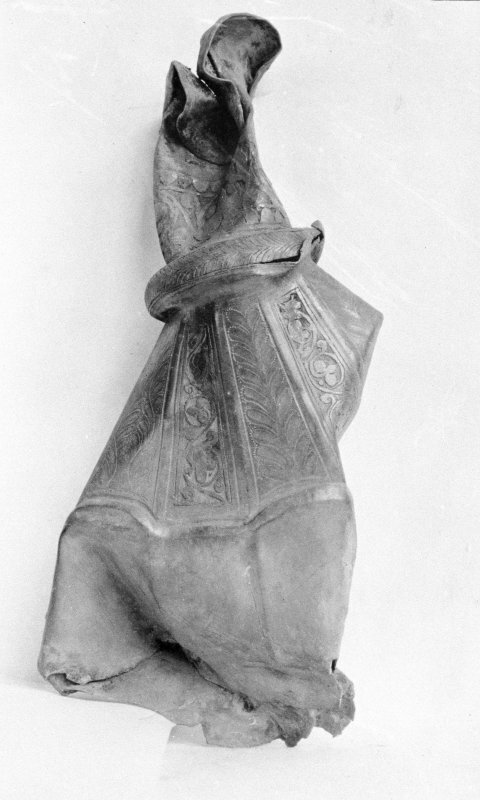 Traprain treasure - "handles of a bowl".From a photograph album of the Curle family, 1911-19. 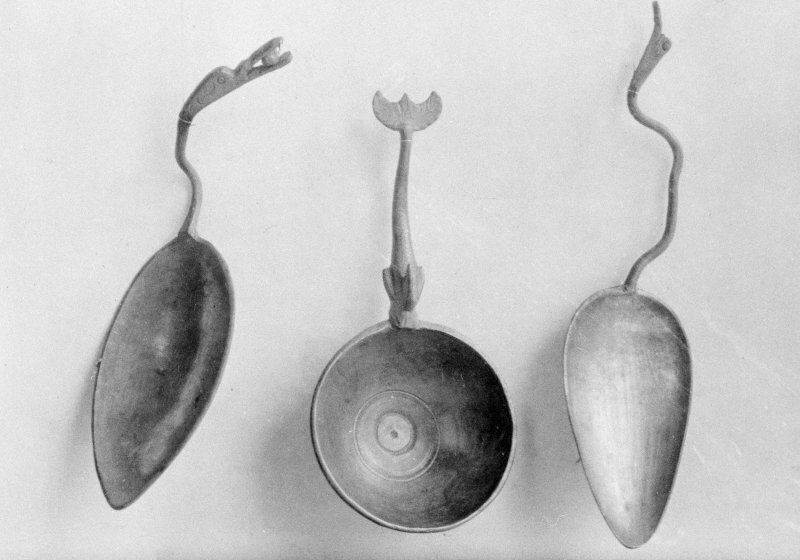 Traprain treasure - "spoons" From a photograph album of the_Curle family, 1911-19. 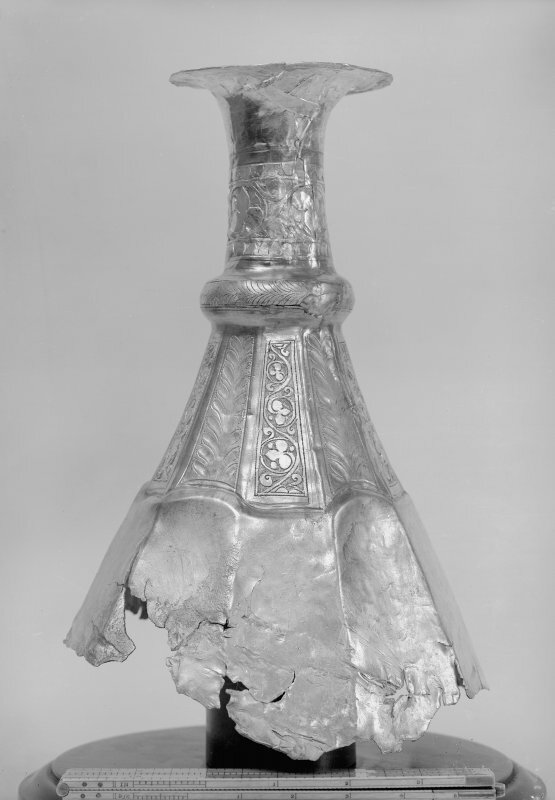 Traprain treasure - "part of a flagon". From a photograph album of the Curle family, 1911-19. Traprain treasure packed and waiting for transport. From a photograph album of the Curle family, 1911-19. 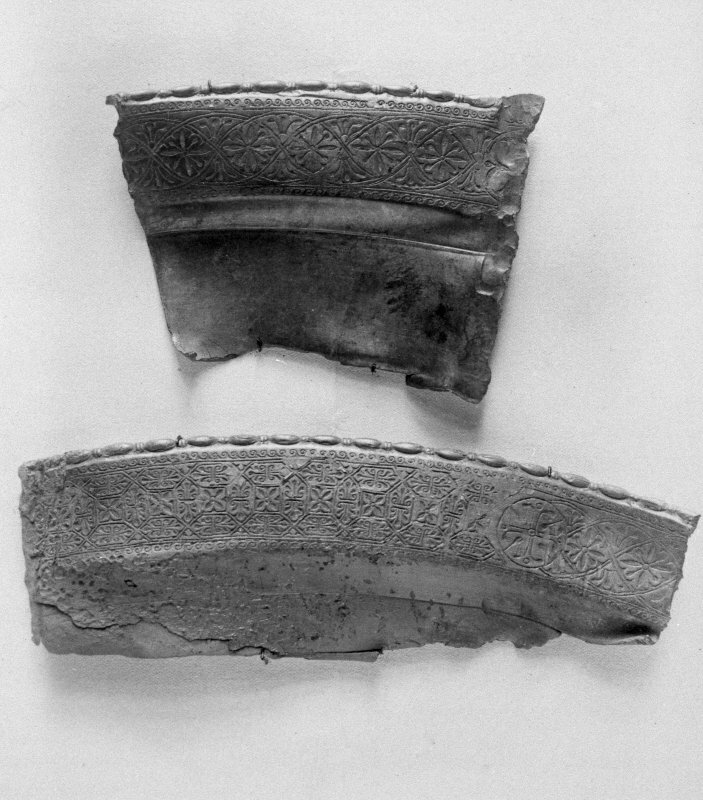 Traprain treasure - "pieces of border". From a photograph album of the Curle family, 1911-19. 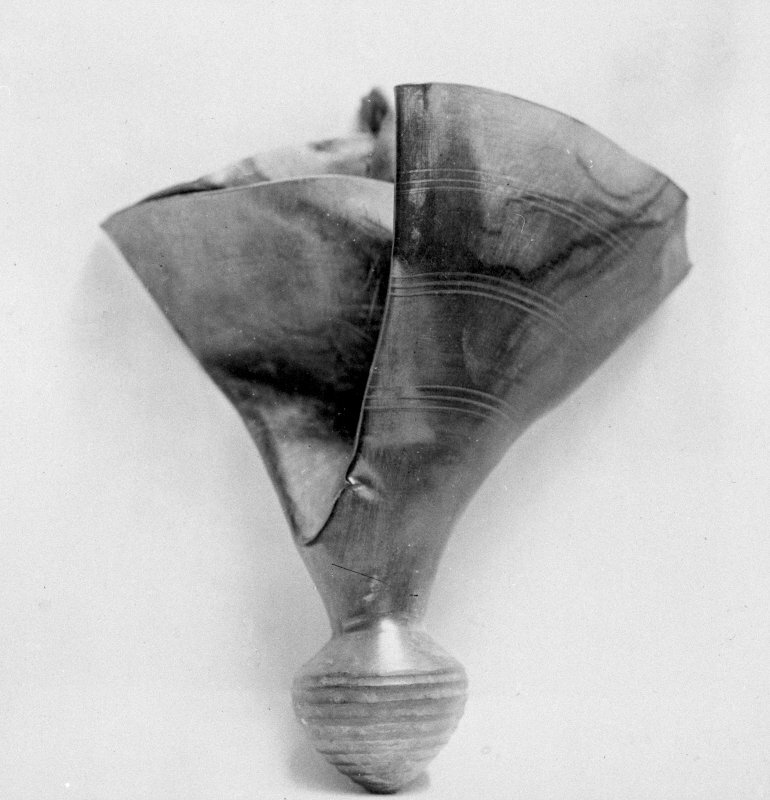 Traprain treasure - "a wine cup". From a photograph album of the Curle family, 1911-19. 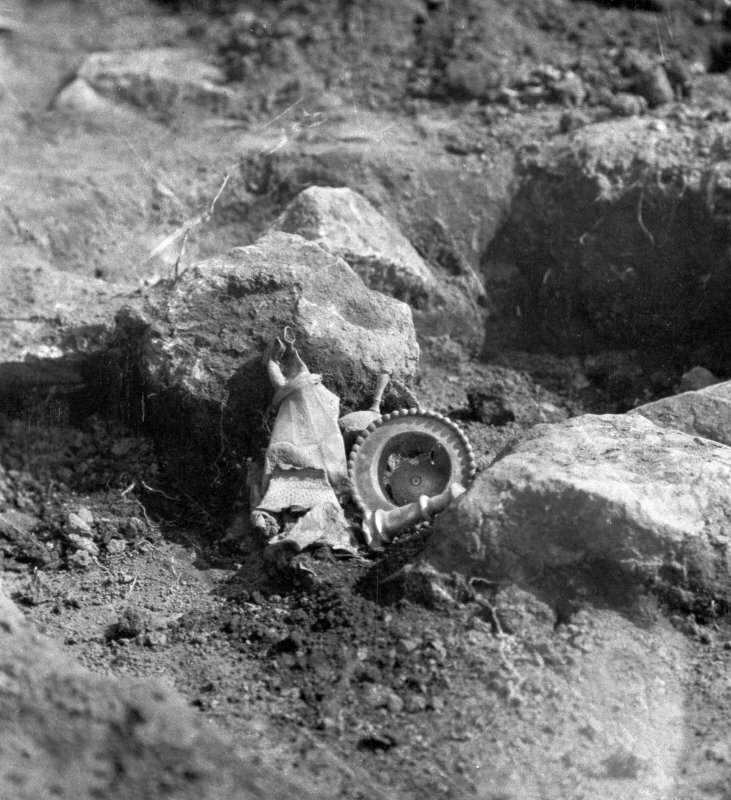 Traprain treasure - "rims". From a photograph album of the Curle family, 1911-19. 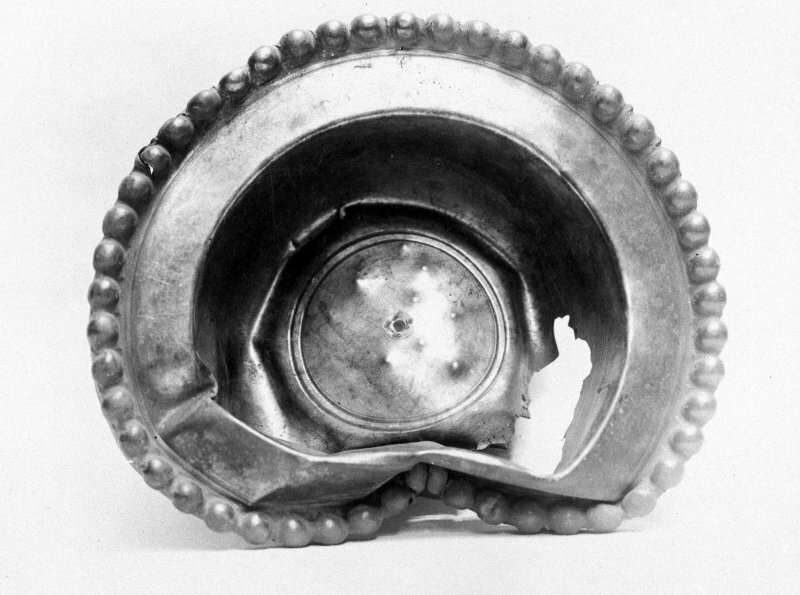 Traprain treasure - "strainer". From a photograph album of the Curle family, 1911-19. 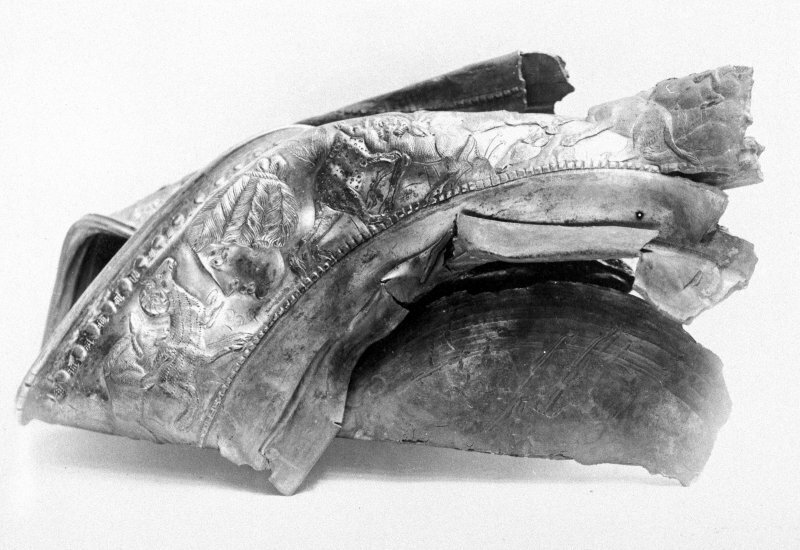 The complete Traprain treasure. From a photograph album of the Curle family, 1911-19. 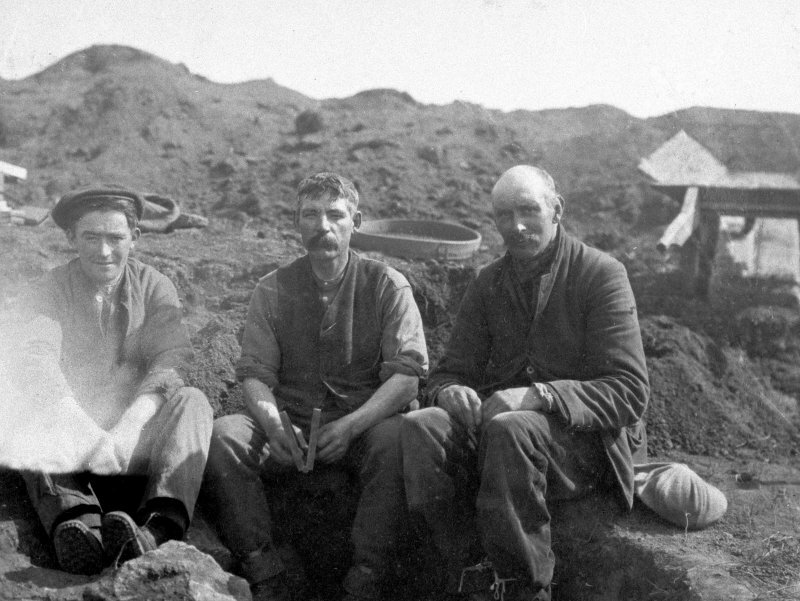 The excavators of the treasure. From a photograph album of the Curle family, 1911-19. 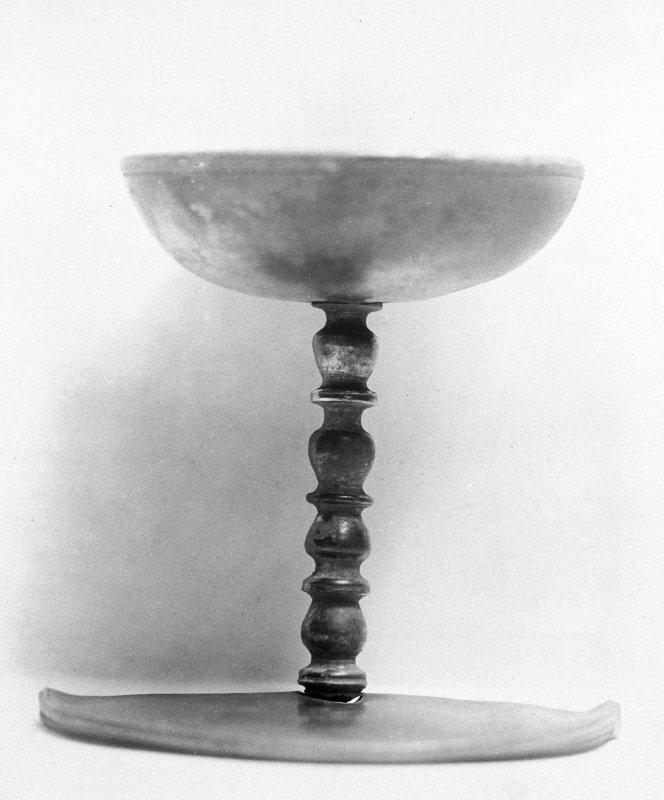 Traprain treasure - "a triangular dish".From a photograph album of the Curle family, 1911-19. 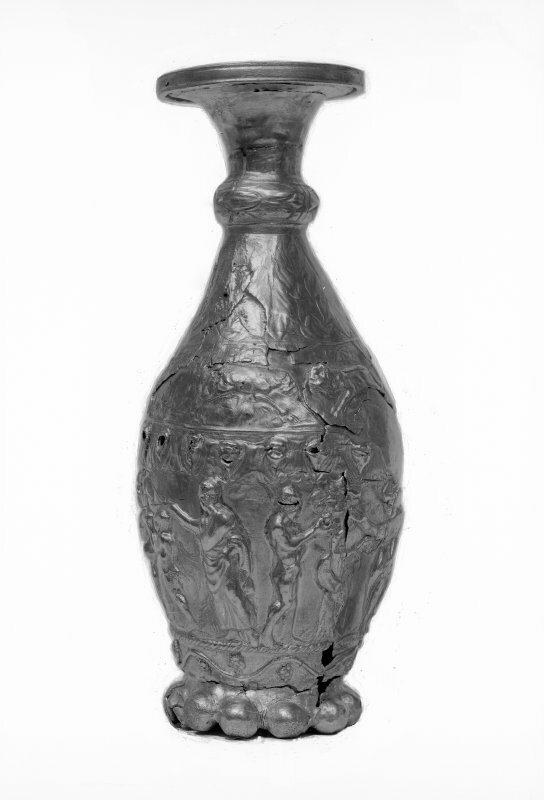 Traprain treasure - "an enamelled flagon". From a photograph album of the Curle family, 1911-19. 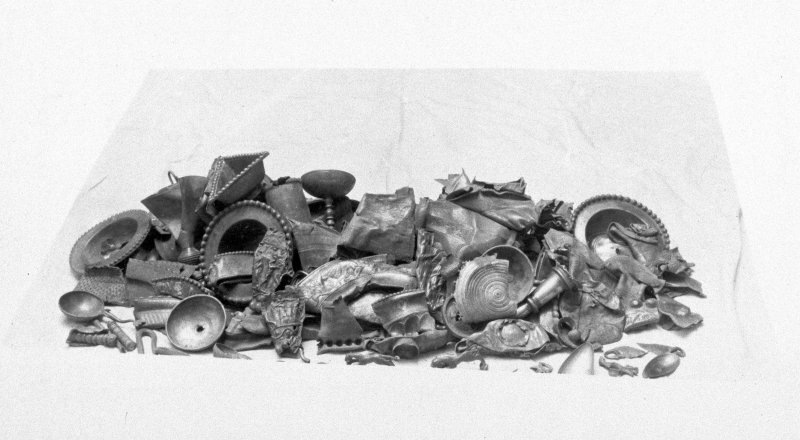 Traprain treasure - "Crushed bowl".From a photograph album of the Curle family, 1911-19. 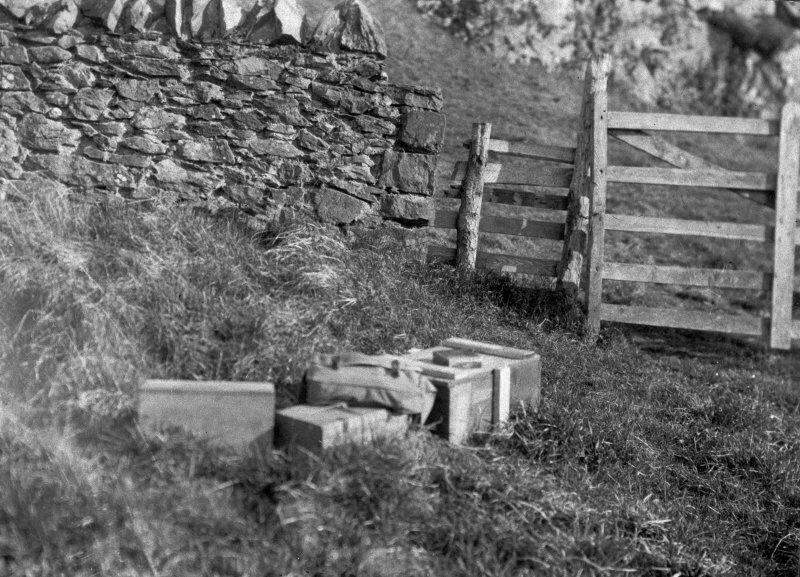 Traprain treasure - "a box".From a photograph album of the Curle family, 1911-19. 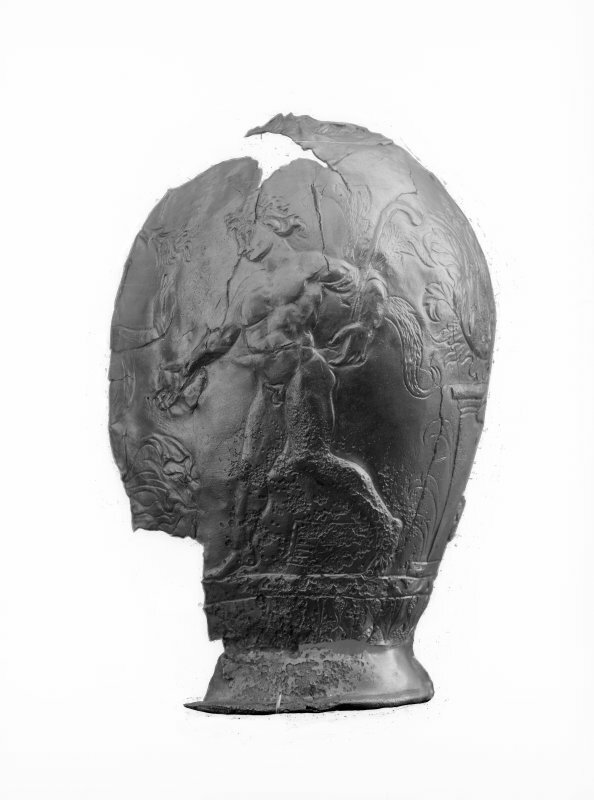 Traprain treasure as found 12 May 1919. From photograph album of the Curle family, 1911-19. Traprain treasure .From a photograph album of the Curle family,1911-19. 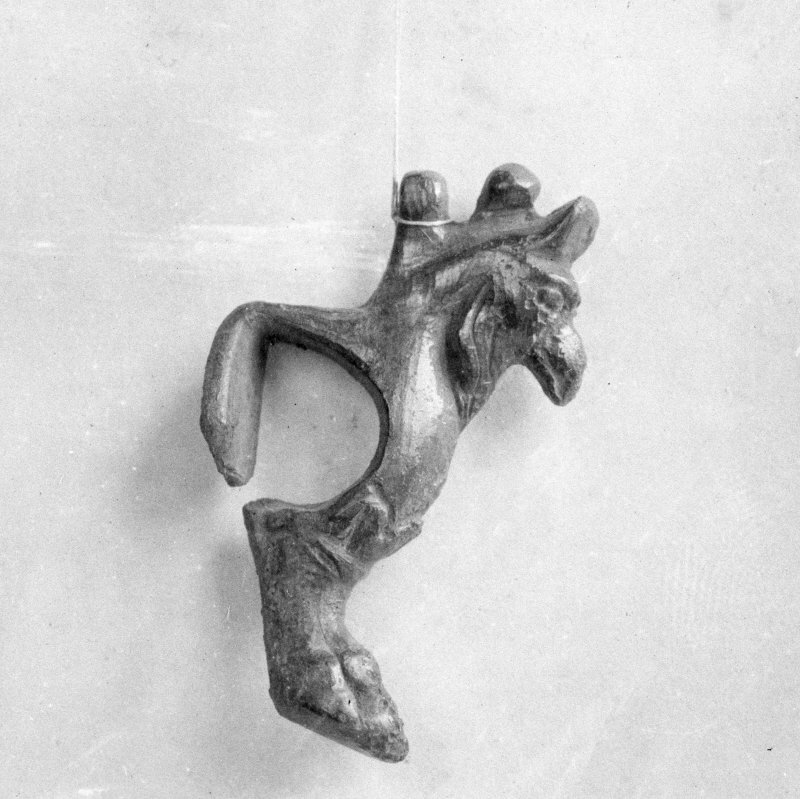 Traprain treasure - "a handle".From a photograph album of the Curle family, 1911-19. 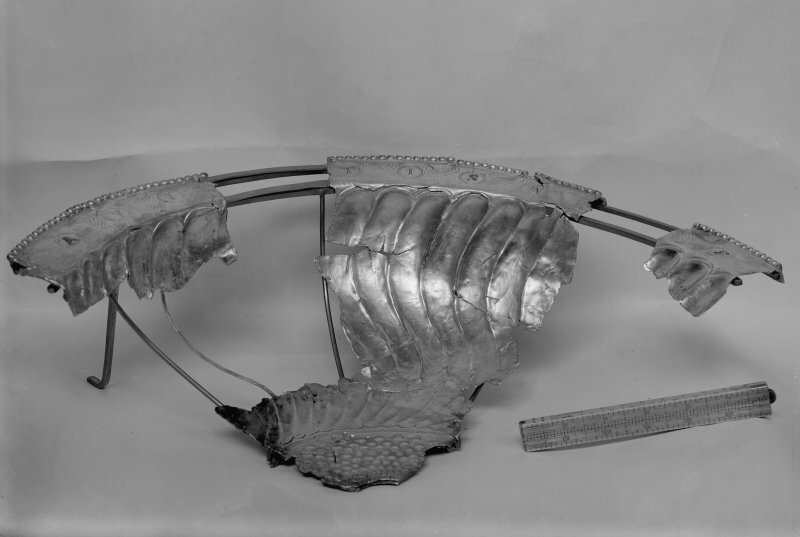 This treasure of Roman silver plate was found (packed together in a pit) within the area of the village on Traprain Law in 1919. It weighs over 53lb. and includes pieces of over 150 objects manufactured at various (unidentified) locations within the Roman Empire in the 4th century AD. Four clipped silver coins (one of Valens and three of Arcadius and Honorius) found in the hoard suggest a date within the range 410-25 AD, although it could be later. 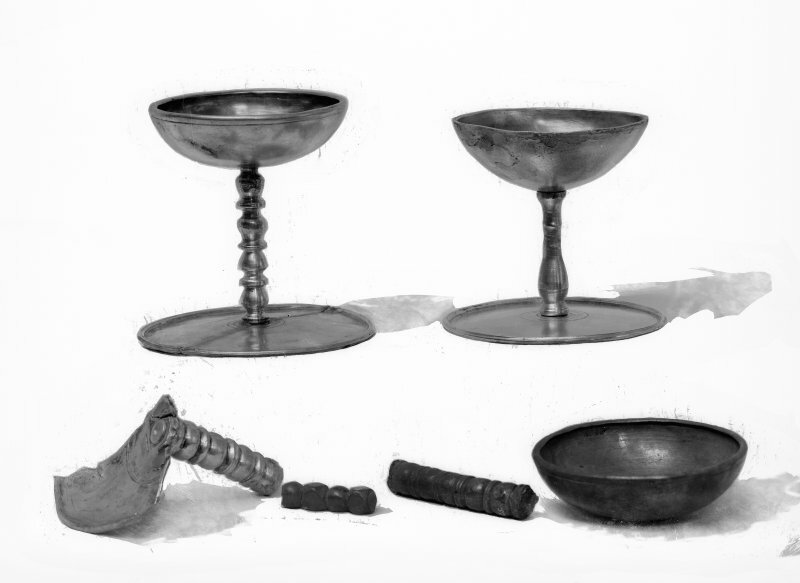 Most of the objects are table silver, but there are also specifically Christian objects (possibly from a church) as well as articles from a lady's dressing-table and from an officer's uniform. 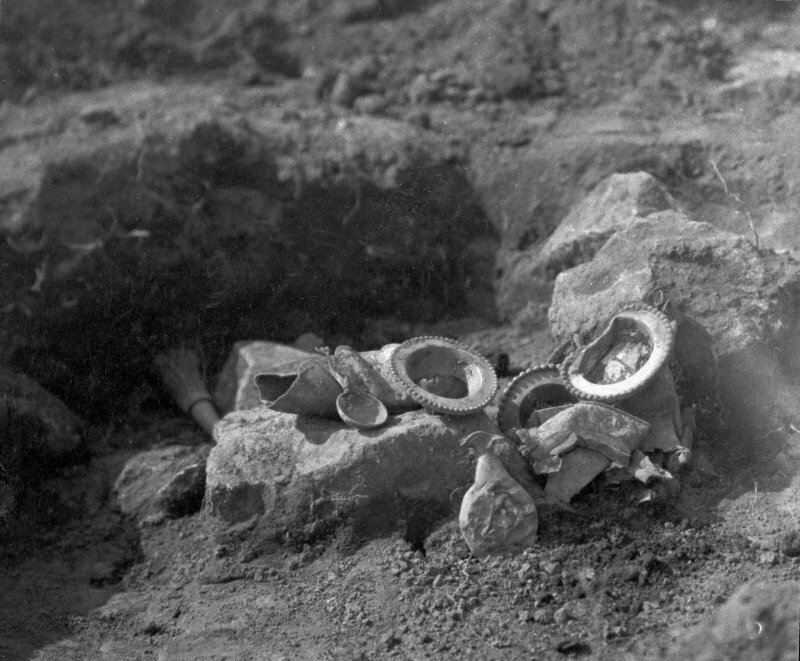 Few objects were found entire, most being cut or hacked into pieces and crushed flat; only parts of some were found. 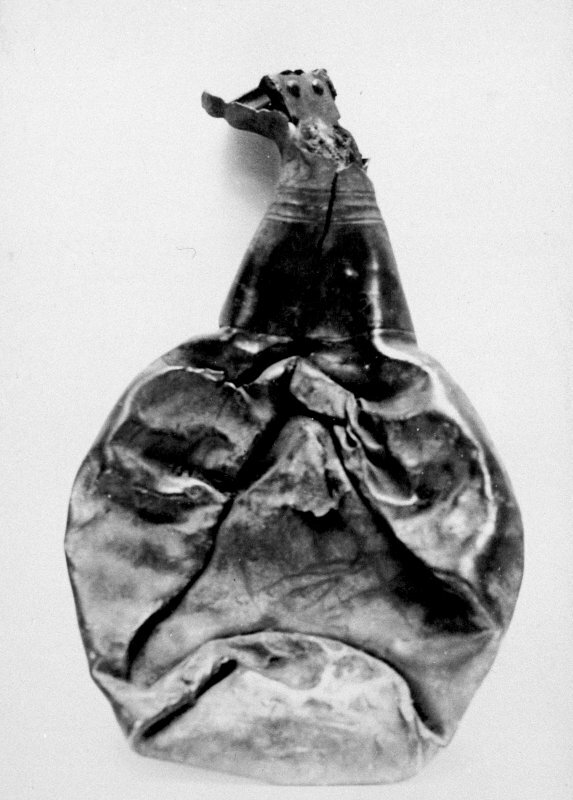 A few pieces were crushed into packets, as if for weighing, the larger such packets weighing betwen a half and three-quarters of a Roman pound. 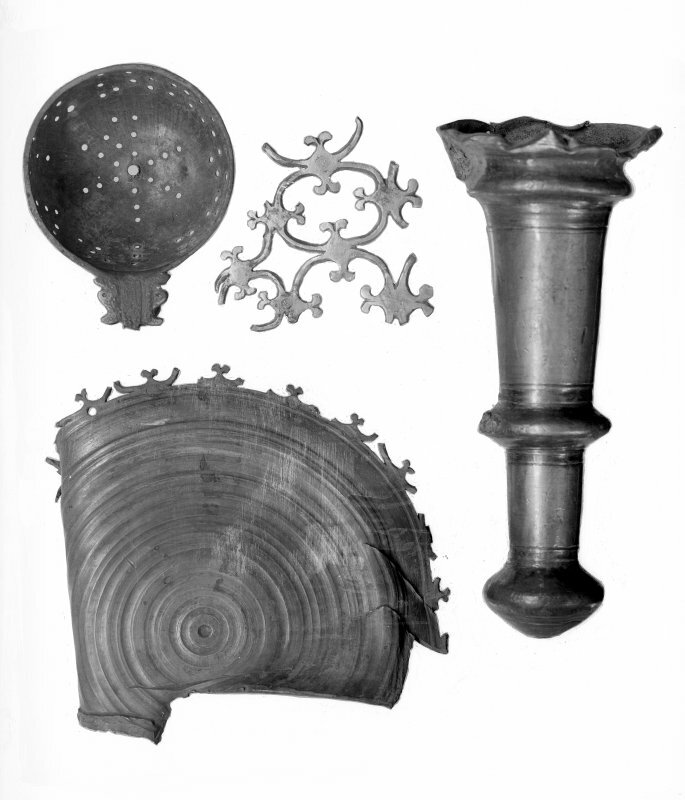 Most of the pieces in the hoard would have been used in dining, and might have been displayed on the sideboard when not in use. They include parts of 8 large jugs (probably used for wine), 5 wine goblets, 50 bowls, 22 flat round dishes, 6 square dishes, 6 spoons and various other pieces. 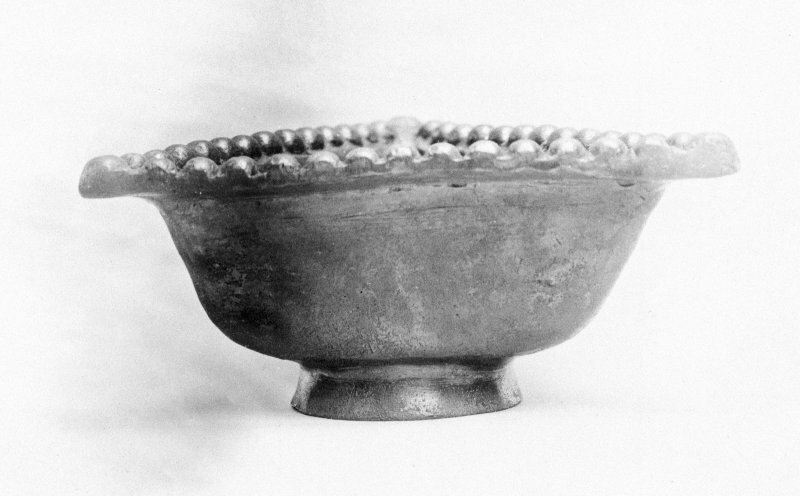 A group of 8 small round bowls and a triangular bowl have beaded rims. One attractive complete piece is a small ladle, perhaps for serving sauces, with a handle in the form of a dolphin. While some bowls and dishes are plain, others are elaborately decorated with gilding and niello inlay; the motifs include scenes of gods, goddesses and heroes, animals in combat, and various foliage and geometric patterns. The mixture of styles indicates manufacture in several different workshops. 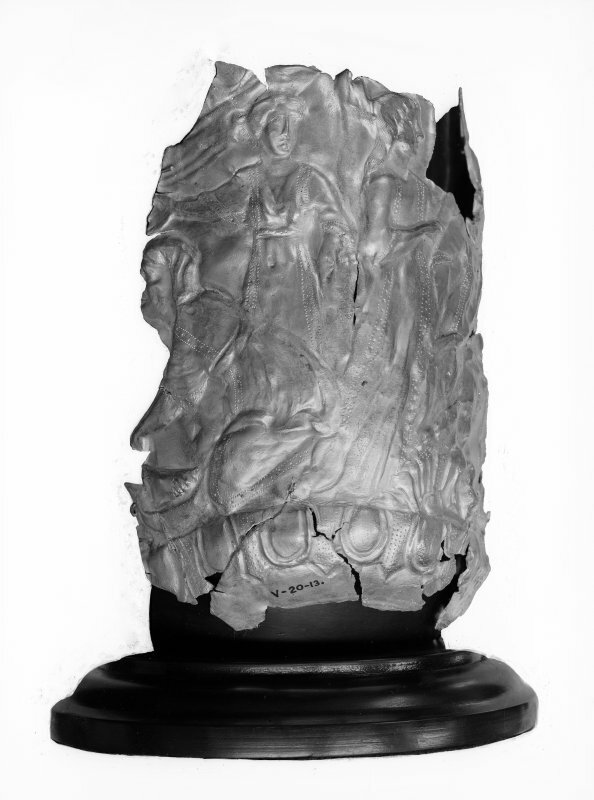 The hoard includes a small group of vessels decorated with Christian scenes or motifs which are paralleled in the hoard from Water Newton (near Peterborough) and were possibly the church plate of an Early Christian community. 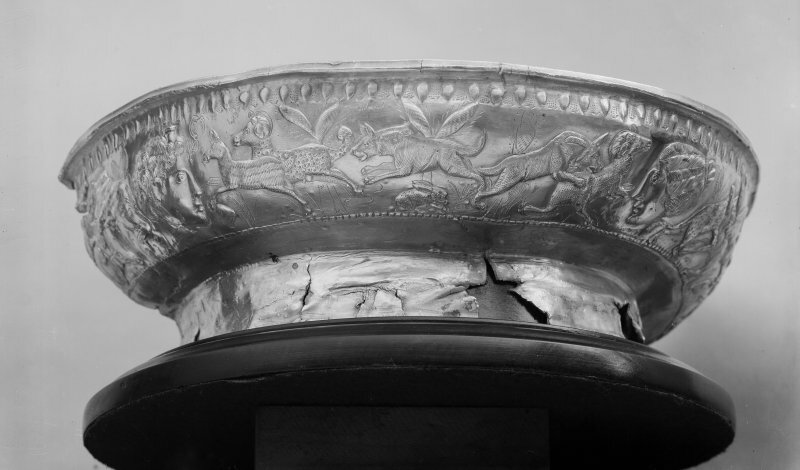 There was no difference in shape between secular and sacred vessels at this date, and identification is on the basis of Christian motifs or inscriptions, most notably the Chi-Rho. 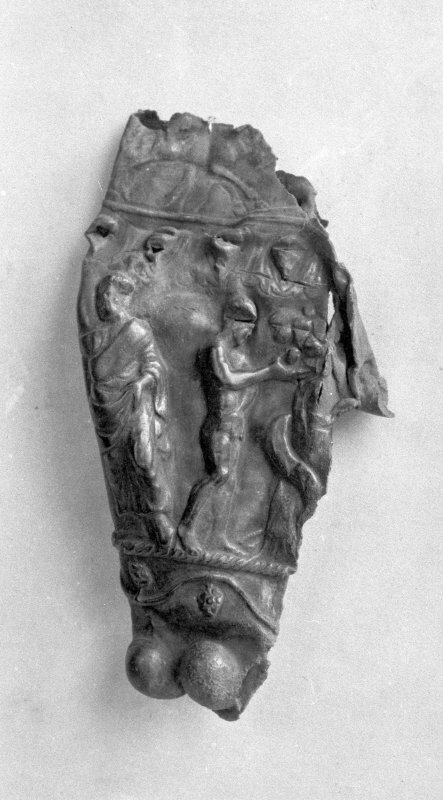 The silver-gilt flask is decorated with four scenes from the Old and New Testaments: Adam and Eve, the Adoration, Moses striking the rock, and a scene which has identified as the Betrayal of Christ by Judas, but may be the miracle of the quails in the desert (another scene from the life of Moses). 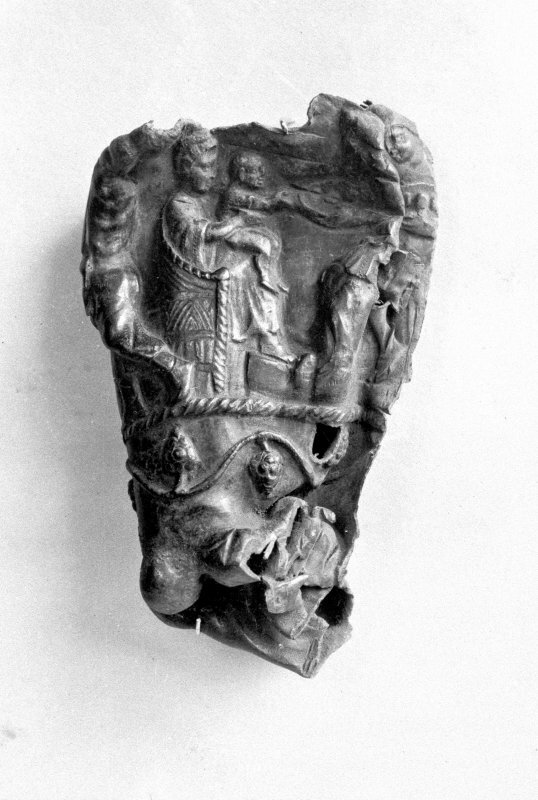 Similar scenes are known from Roman stone coffins and from paintings in the Catacombs, but this is one of the earliest-known examples of Christian scenes depicted on metalwork. 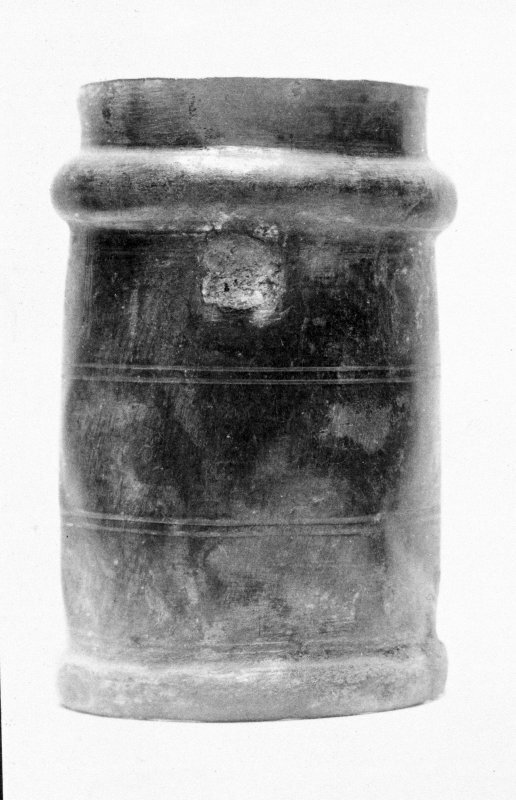 A second smaller flask of similar shape has a Chi-Rho, A and O, and an inscription of uncertain meaning. 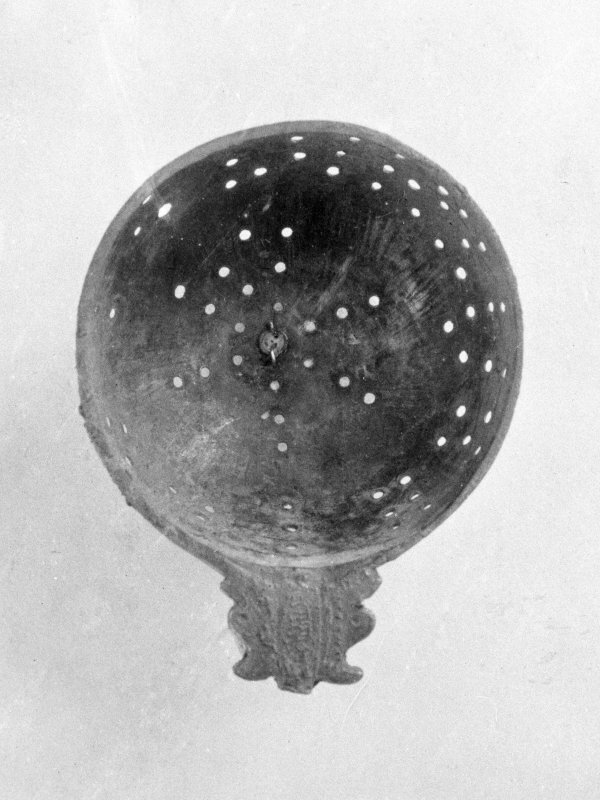 A small strainer, whose long handle is now missing, has a bowl perforated in the shape of a Chi-Rho with further holes below the rim forming the words 'Jesus Christus'. 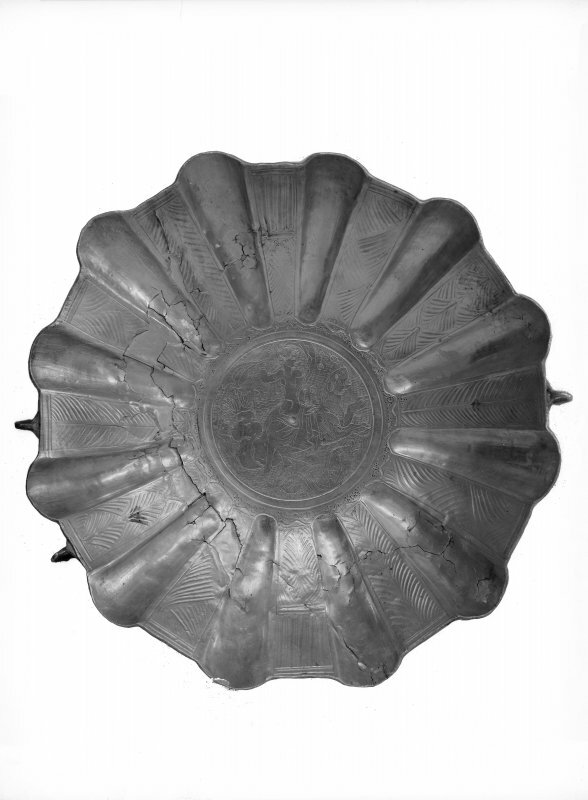 Strainers were a normal part ofa set of vessels for serving wine, but this one must have been made for a church. 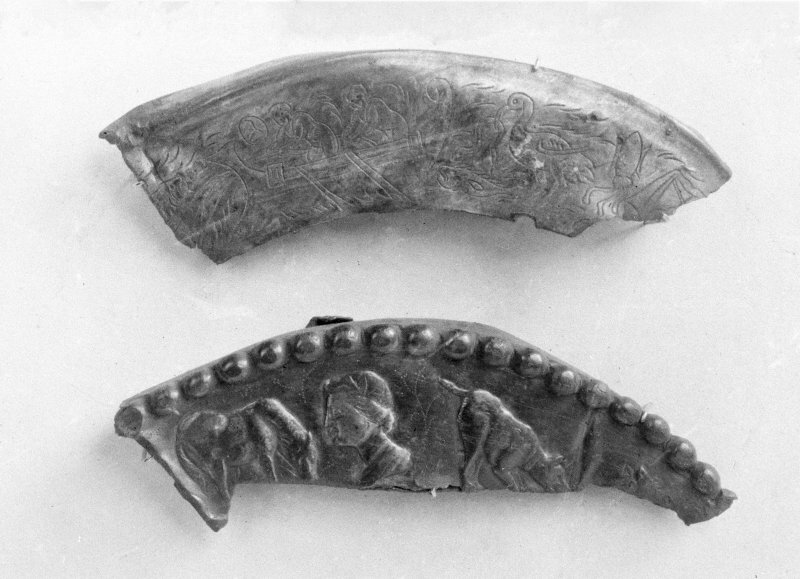 Two of the spoons in the hoard have a Chi-Rho motif inside the bowl while another has a fish engraved on it. 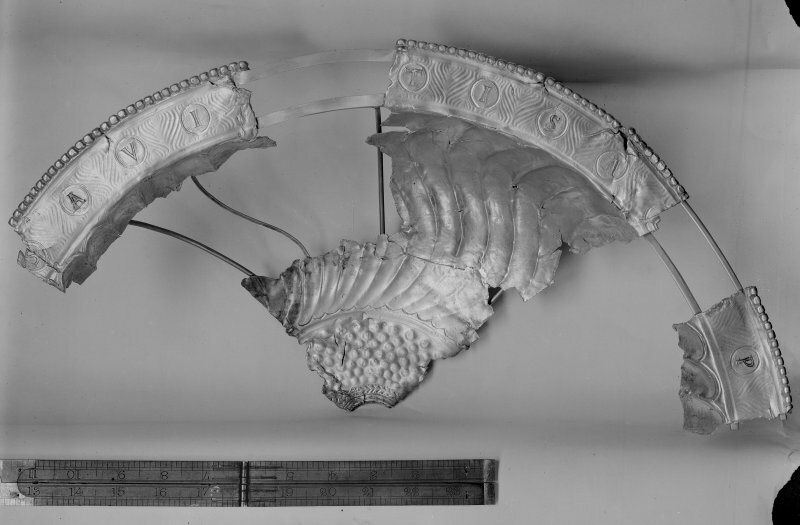 Such spoons are not necessarily church plate, but would have belonged to a Chistian household. 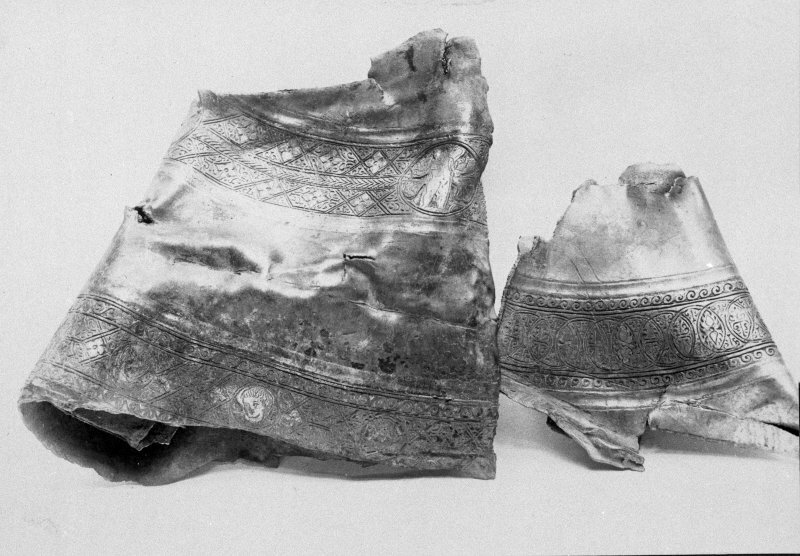 Two fragments of silver mirrors have recently been identified; these were flat and polished on one side with a loop handle attached to the other. 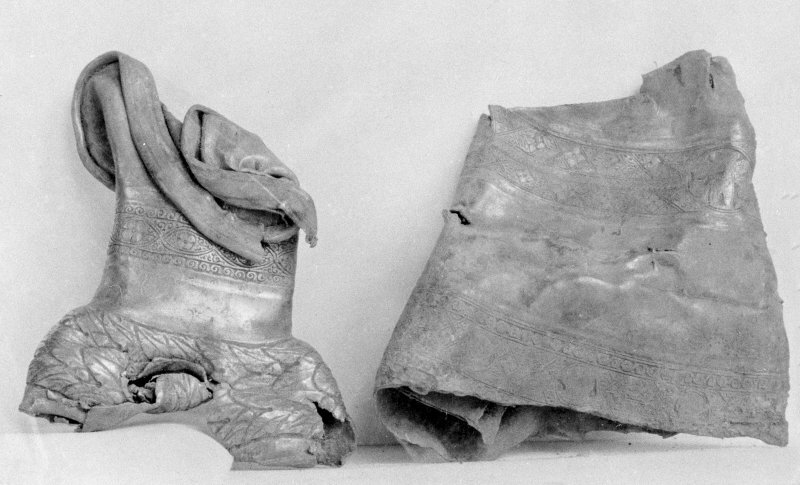 Parts of tall silver jars probably came from a toilet box and held ointments. Another group of objects appear to be fittings from a military officer's uniform and are of types otherwise known only in bronze. 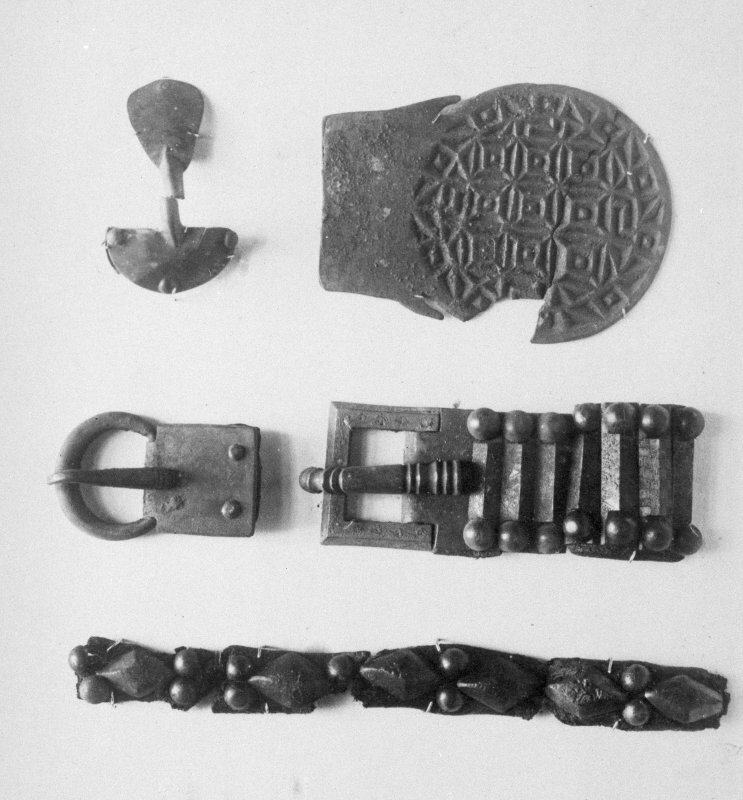 These buckles and strap fittings reflect Germanic taste, particularly the strap-ends with their 'chip-carved' ornament of a type which resembles some forms of carved decoration on wood; it used to be thought that such pieces must have belonged to Germans from outside the Empire, but they are now recognised as having been common in the late empire, although one buckle and a brooch are of types only paralleled in Hungary. 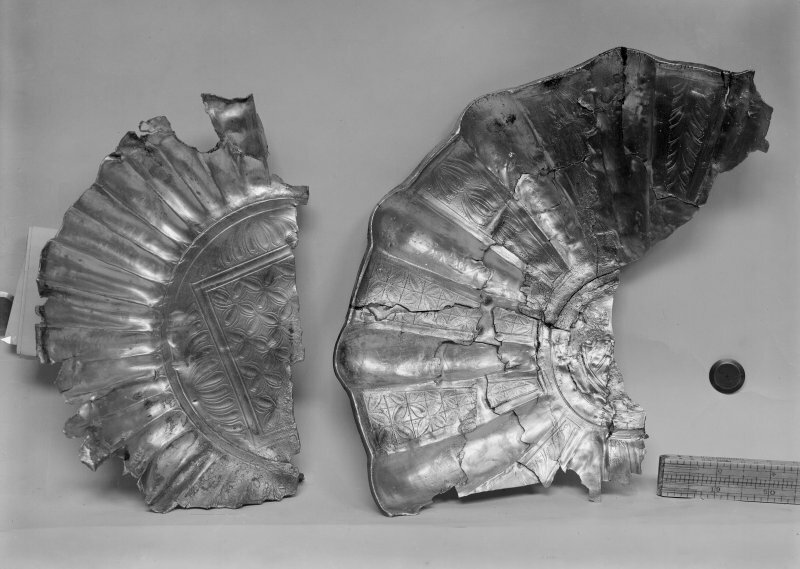 The hoard has traditionally been explained as loot brought back from the continent by British raiders, but discovery of a hoard of complete silver vessels at Mildenhall (Suffolk) indicates that material of this quality could be found in raiding in southern Britain. It has also been suggested that it represents payments to native mercenary troops or allies assisting in defence against the Saxons, comparable hoards being cited at Coleraine and Balline in Ireland. Almost all the objects have been restored and regilded for display. Summarising the story of an excavation or a site can be one of the most difficult things for an archaeologist. To who should it be addressed? What is the vital information? Where should the emphasis be laid? Each of us writes for our audience, and we all try to balance between information and hyperbole. Many archaeological sites read as a palimpsest (1) but the representation of that story in writing and illustration, or archaeological records like Canmore, presents a significant challenge. This challenge is brought into focus at Traprain Law, a volcanic hill set among rich East Lothian farmland. While deceptively simple at first glance, the archaeology of Traprain is made especially complex by both its sheer size and the richness of the archaeological finds (about 5% of the site has been excavated over the years). 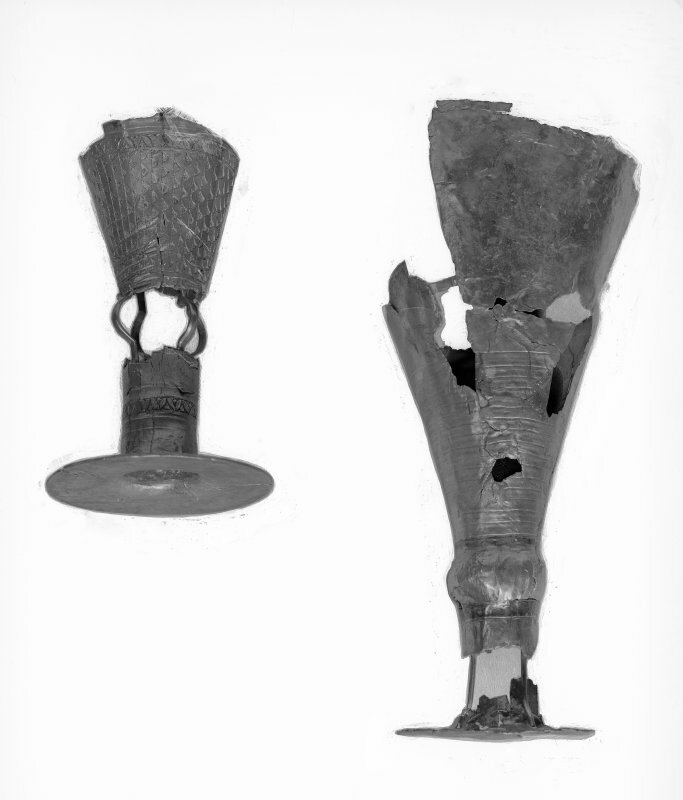 Numerous objects from the Late Bronze Age period through to the late Roman period in particular have been recovered, representing burial, settlement, agriculture and trade over 1,500 years. 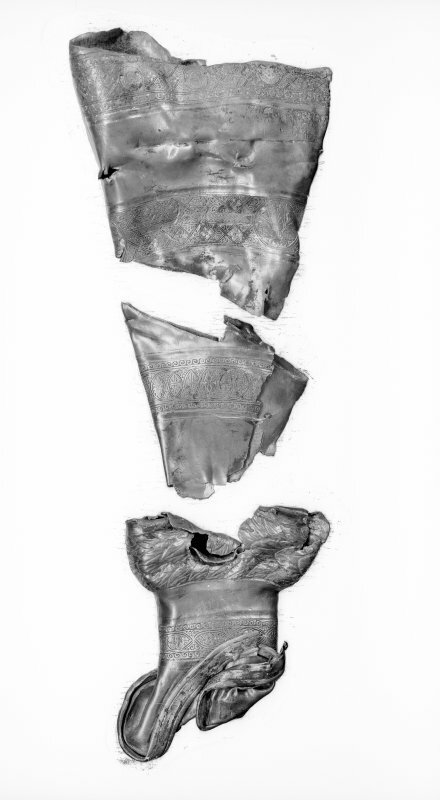 One of the most exciting came in 1919 when workmen uncovered a pit containing 34kg of Roman silver, but remarkable discoveries have continued: a small hoard of Late Bronze Age axe-heads came to light in 2004. Activity continued in later years and there is a growing argument for medieval occupation and burial on the summit, a reminder of the link to St Kentigern - recorded in the 12th century - and the existence of a 16th century beacon. Two hundred years later plantations of trees were established on the summit, and in the late 19th and 20th centuries the NE of Traprain was the site of the one of the county’s largest quarries. For archaeologists of the 1950s and 1960s, Traprain was considered as a prehistoric fort since it is enclosed by a large defensive ramparts. Creating their records in 1962, the Ordnance Survey recognised the fort and some 26 categories of find, from spindle whorl to arrowhead. Separate cards recorded each element, listing the relevant references, and a thorough critical summary was provided. The term fort, while satisfactory in some contexts, here disguises the complexity of the site and its long history of settlement. The difficulties of organising information are compounded when one considers the archive material – some 700 items survive including plate photographs, manuscripts, and drawings, many of which offer subtle clues or critical enhancements in understanding. 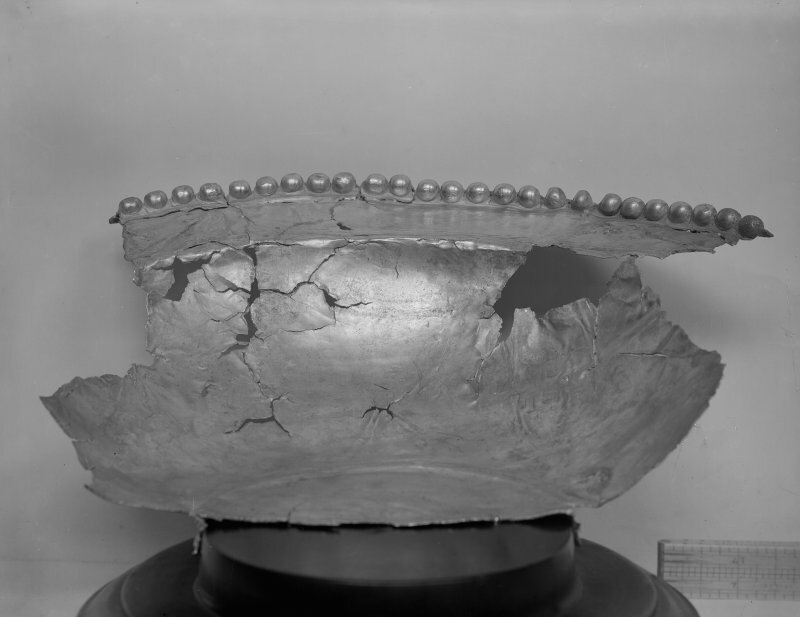 The finds, most of which are housed in our National Museum, present another rich seam for study, and recent re-analysis has offered new perspectives. While the organisation and structure of archaeological information clearly presents a challenge, the survey of the Traprain has also caused significant difficulties. Despite the fact that the Law was at the centre of the county Ordnance Survey in 1851, even the largest ramparts of the fort escaped record until 1906 (though a detailed survey of nearby Chesters fort was prepared in 1851). Early excavators provided only a schematic plan, and the RCAHMS Inventory of 1924 relied on the 6-inch map. The task of preparing a large-scale plan fell to RCAHMS in 1955, led by their archaeologist Richard W Feachem. Due to the size of the hill and the steepness of the slopes, Traprain presented a particular challenge requiring some 120 survey stations. The inked plan, still regularly reproduced, was crucial in demonstrating the existence of at least four different forts, not the one or two previously supposed. One mistake took 25 years to correct – because of differences in the orientation to magnetic or grid north, some trenches were drawn at the wrong angle! During this summer HES Survey and Recording are preparing a new survey of Traprain and will face many of the same challenges. The survey will be split into three parts – collection of data, archaeological interpretation, followed by depiction and dissemination. We are now spoiled by the ability to call on centimetre accurate GPS equipment which will, but for the most awkward area among steep cliffs, provide an accurate spatial fix. To this we can add a 3D model developed from hi-resolution aerial photographs and, using visualisation software, this will allow the enhancement of specific slopes in order to help us ‘read’ elements the landscape. Interpretation has come on in other ways since 1955 and the experience of RCAHMS in the Borders, Perthshire, Aberdeenshire and Dumfriesshire in particular has helped the surveyors see more clearly than two generations ago, and to pick up nuance and subtlety which in 1955 may have simply been generalised out. Depiction though is a fast developing art. Where careful use of ink pen and hachure was the mode then, depiction now relies on skills with software and the application of field interpretation in 3D represents a significant (but potentially rewarding) challenge. Clarifying the natural hill from the archaeological features, exposing the character of stratigraphic relationships, and piecing together a coherent narrative are still the order of the day. While Traprain retains a particular significance in Scotland, the wider archaeological picture has dramatically changed since the first excavations in 1914. Where the 1924 Inventory recorded some 264 sites in East Lothian dated earlier than 1707, the current record in Canmore number some 3404 archaeological sites. The discovery of cropmark sites in the fields surrounding the Law has completely changed our notion of Traprain as an isolated capital, while programmes of excavation such as the Traprain Law Environs Project and the archaeology of the A1 road have transformed the regional picture. That said, the Law still presents an extraordinary picture of prehistoric and historic activity and is a special place whose resonance will continue through the ages. Why not take a walk up it the next time you are out there and see how many ramparts you can find!